The cause of death was inclusion body myositis, an incurable disease which causes progressive muscle weakness and ultimately death. Even in this Shubik demonstrated the gusto with which he approached anything new that interested him. “When he found out he had this rare disease, he started a database at Yale for the disease and he funded research into it,” his wife Julie told the New Haven Register. A taste of his scholarship and his wit is offered by this excerpt from a biography from the Institute for Operations Research and Management Sciences (INFORMS). In the dollar auction, players with perfect information in the game are compelled to make an ultimately irrational decision based completely on a sequence of apparently rational choices made throughout the game, with both the winner and second highest bidder paying more than $1 to win $1. “So Long Sucker,” devised by Shubik, Shapley, Nash and Mel Hausner, is constructed in such a way that winning requires players to go back on agreements reached with each other in the course of play. Martin S. Shubik was born in Manhattan on March 24, 1926. His father Joseph had emigrated to Britain to escape the Russian Revolution, and in the mid-20s accepted a short posting to New York City for the textile company he worked for. In 1928 Joseph and Martin’s mother Sara brought their family to England, where they all remained until World War II. During the Blitz, Martin, his siblings and their mother relocated to a Toronto suburb. He won a scholarship and earned bachelor’s and master’s degrees in mathematics and political economy from the University of Toronto. At the same time, to maintain his university eligibility, Martin enlisted in the Royal Canadian Navy and served as a lieutenant specializing in electronic warfare until he mustered out in 1950. I loved history, and I then had to make some hard choices. I looked over the calendar at the University of Toronto and decided if I wanted to really enjoy myself, I’d go into history. But how was I going to make a living out of history after? I then looked further and concluded that my eventual goal had to be the social sciences. But I then looked at what the social sciences had to offer in 1942, and it looked like finger-painting as far as I was concerned. It seemed ridiculously elementary. So in 1942, I made the decision that I was a lousy mathematician and was probably not going to ever become a competent mathematician. But I appreciated mathematics, I appreciated the fact that I might be able to work with competent mathematicians. And I also made the wild guess that in the future decades, the social sciences were going to become highly mathematized. So I said to myself, look. You know what you want to do. Go into mathematics and physics. While in a class on econometrics at the University of Toronto, he had to find some new book that included econometrics and review it. 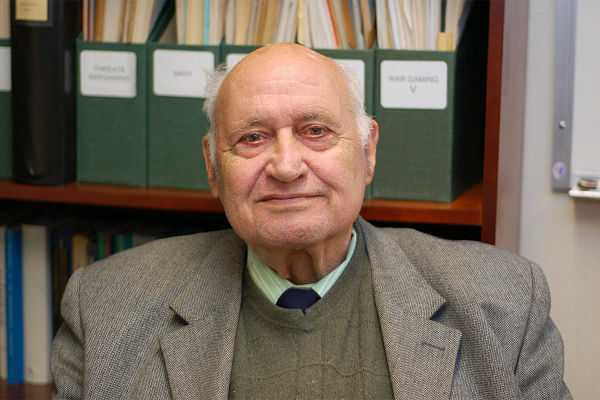 In the library, Shubik picked up John von Neumann and Oskar Morgenstern’s The Theory of Games and Economic Behavior, “and the rest is history,” as he told Sobel. In 1963 he accepted a professorship at the then-Economics of Organization Department of Administrative Sciences at Yale, and remained there as his primary academic home since. He was a founding faculty member of the Yale School of Organization and Management (later the School of Management) and director of the Cowles Foundation for Research in Economics from 1973-76. He served in a number of roles at Yale, becoming the Seymour H. Knox Professor of Mathematical Institutional Economics — a term he coined — at what was then the new School of Management. He became emeritus in 2007. His practicality surfaced in his job choices, since he routinely worked for private industry and national governments. He consulted or was employed by General Electric, IBM, Ford and the Rand Corporation in addition to visiting professorships in Vienna, Melbourne, and Chile, as well as being an external scholar at the Santa Fe Institute since 1994. Shubik remained intellectually active until his death, and currently has a paper in press. He wrote more than 20 book and authored or co-authored more than 300 academic papers. A number of those articles appeared in the SAGE journals Simulation & Gaming and the Journal of Conflict Resolution. This entry was posted in Impact and tagged Economics, Game Theory, Martin Shubik, Passings. Bookmark the permalink. Post a comment or leave a trackback: Trackback URL.